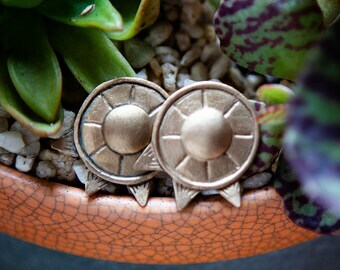 love these pomegranate studs... nice muted bronze color. These silver "barnacle" earring are a great twist on just plain silver ball studs.... very neutral to wear with lots of outfits. Great seller, fast shipping, and careful packaging. Darling little pomegranate pendant necklace; thank you! Ever wondered what the back of Bakara looks like? Here it is! I love putting detail all over the armor rings. Makes it more special somehow! I do love my tools! I’m obsessed with the idea that an object can be more than the sum of its parts. I take words from literature, video games, and pop culture and turn them into pieces of wearable art. The words become part of the piece and turn it into a talisman, hopefully giving the wearer a little boost through the day. I primarily work in silver and bronze metal clay, which I craft by hand—carving, hammering, soldering, and polishing—until each piece tells a vivid story. I started my journey in order to bring to life some of the beautiful images I saw in books; each piece a reminder of a passage. Some are chosen for their meaning, like the fox from The Little Prince. Some are chosen because the imagery is lovely, like pomegranates from the myth of Persephone. Like all literary mediums, the more you pay attention to the detail and subtle beauty, the more enjoyable each piece will become. I believe that intentionality is everything and that good thoughts will create good actions. 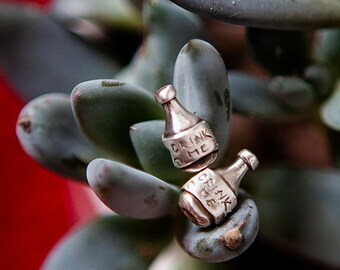 By creating jewelry imbued with words of friends, love, and humor, I try to make the world a little more beautiful. Owner, Maker, Designer, Photography, And Shipping, And Customer Service, And Dog-cuddler. I discovered my love of jewelry during college, and have been teaching myself the art of metalsmithing ever since. I work primarily in silver and bronze metal clay. I'm Lyssa, the one-woman show of Melissa Dawn Designs. I work with silver, bronze, and gold to create the perfect pieces to tell your story every day. Each piece is individually hand crafted by me. All pieces ship from a smoke-free, cat-free house. When your purchase is completed, I make, package, and mail the item. Pieces are shipped in a bow-tied box and 100% recycled content bubble mailer via USPS First Class with tracking. If you have any question about the items in my shop, feel free to Convo me, and I will respond within a day. All jewelry is carefully packaged in a cotton-filled, bow-tied box, and placed in a 100% recycled content bubble mailer. If your package is somehow harmed during shipping, Convo me within 10 days, and I will do my best to fix your jewelry, or, in extreme cases, replace it. Made to order items are subject to a 15% restocking fee, and custom items are not refundable. All jewelry (within the US) is shipped with insurance and a tracking number. Payments are accepted via Paypal and Etsy Direct Checkout. Don't have a PayPal account? Luckily, you don't need to have an account to use it! After choosing PayPal during check out, scroll down to find the section where you can pay via credit card without registering for an account. Non-payment after 10 days will result in cancellation of the transaction. Purchases in North Carolina are subject to a 7% sales tax. Many pieces are made to order, so please allow up to 3 business days before I send your jewelry. I send out Convos with estimated shipping dates as soon as I can after your order is processed! If there are any delays (such as national holidays I forget about) I will keep you updated on your package. I mail on weekdays after payments have cleared. All pieces are shipped USPS First Class which usually takes about 3 days in the US. All First Class Packages come with insurance and a tracking number. International orders can take a few weeks, depending on customs, but international buyers, especially in Europe, have reported very good shipping times, typically a week. All designs are © Melissa Fineman. Feel free to Pin them, Clip them to Polyvore, or share them on social media, but please make sure you CREDIT or TAG Melissa Dawn Designs. Thank you for loving my work! I am able to wholesale certain items! Please Convo me for wholesale pricing and minimum orders. Thank you!